This document describes changes to Galaxy’s tooling framework over recent releases. Tools may (and should) now declare a profile version (e.g. <tool profile="16.04" ...>). This allows Galaxy to fire a warning if a tool uses features too new for the current version and allows us to migrate away from some undesirable default behaviors that were required for backward compatiblity. The job script generated with profile 16.04+ tools will include a #set -e statement causing this behavior by default. Older-style tools can enable this behavior by setting strict="true" on the tool command XML block. Previously the default behavior was for Galaxy to ignore exit codes and declare a tool in error if issued any output on standard error. This was a regretable default behavior and so all tools were encouraged to declare special XML blocks to force the use of exit codes. For any tool that declares a profile version of 16.04 or greater, the default is now just to use exit codes for error detection. A few tool features have ben removed from tools that declare a version of 16.04 or newer. The interepreter= attribute on command blocks has been eliminated. Please use $__tool_directory__ from within the tool instead. format="input" on output datasets has been eliminated, please use format_source= to specify an exact input to derive datatype from. Disables extra output file discovery by default, tools must explicitly describe the outputs to collect with discover_dataset tags. Tools require a version attribute - previously an implicit default to 1.0.0 would be used. Previously, Galaxy would fill tool working directories with files related to metadata and job metric collection. Tools will no longer be executed in the same directory as these files. This applies to all tools not just profile 16.04+ tools. Dependency resolvers tell Galaxy how to translate requirements into jobs. 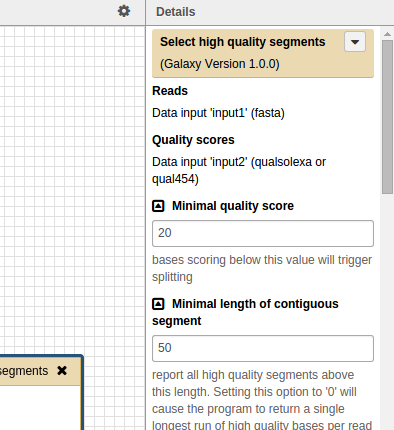 The Conda dependency resolver forces Galaxy to create a conda environment for the job with FastQC at version 0.11.4 installed. Only dependency resolver that can be installed at runtime - great for Docker images, heterogeneous clusters, and testing tools. The Galaxy toolbox can be reloaded from the Admin interface. Tool conf files (e.g. tool_conf.xml) can be monitored and automatically reloaded by Galaxy. Tool conf files can now be specified as YAML (or JSON). This will produce a file referenced as $json_inputs that contains a nested JSON structure corresponding to the tools inputs. Of limitted utility for simple command-line tools - but complex tools with many repeats, conditional, and nesting could potentially benefit from this. For instance, the JBrowse tool generates a complex JSON data structure using a configfile inside the XML. This is a much more portable way to deal with that. data_collection tool parameters (params) can now specify multiple collection_types for consumption (PR #1308). This mirrors the format attribute which allows a comma-separated list of potential format types. Multiple collections can now be supplied to a multiple="true" data parameter (PR #805). Output collections can specify a type_source attribute (again mirroring format_source) (PR #1153). Tools may now produce explicit nested outputs PR #538. This enhances the discover_dataset XML tag to allow this. Allow certain output actions on collections. PR #544. Allow discover_dataset tags to use format instead of ext when referring to datatype extensions/formats. Allow min/max attributes on multiple data input parameters PR #765. Galaxy now contains a plain text file that contains a list of tools whose output can be trusted when rendering HTML. The workflow editor was updated to the use Galaxy’s newer frontend tool form. Tools may now use inputs to define environment variables that will be set during tool execution. The new environment_variables XML block is used to define this. Test tool demonstrating the use of the environment_variables tag. 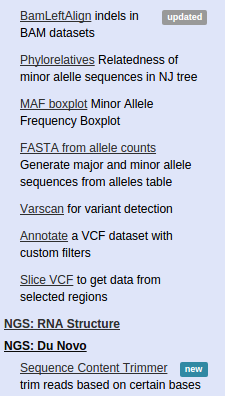 The filter tag has been implemented for output dataset collections (PR #455. See the example tool output_collection_filter.xml.